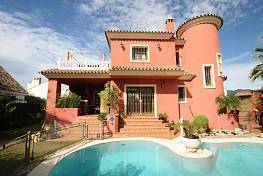 - Magnificent villa located within a gated community offering 24hr security on one of the highest plots in the Valley of Nueva Andalucia, enjoying panoramic views over the golf courses, mountain, sea, Gibraltar and Africa. 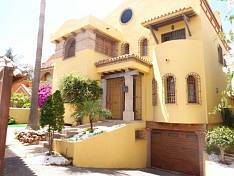 Originally built in 1988, refurbished and extended in 2002 to a very high standard yet still maintaining the essence of Spanish charm. The property offers an elegant entrance hall, six bedrooms, four bathrooms, spacious lounge with fireplace, dining room, large fitted kitchen, office, two play rooms, games room, wine cellar, laundry room, storage and two cloakrooms. The master bedroom is en-suite with Jacuzzi bath, separate shower and His & Hers dressing rooms as well as a treatment room. The property further features a gymnasium, home cinema, indoor heated swimming pool with sauna, Jacuzzi and a Turkish bath, various terraces, a roof terrace with spectacular views.